On this week’s Midnight Snack, we took a look at one of America’s (and college students’) easiest junk foods to throw in the microwave for a kinda okay snack. 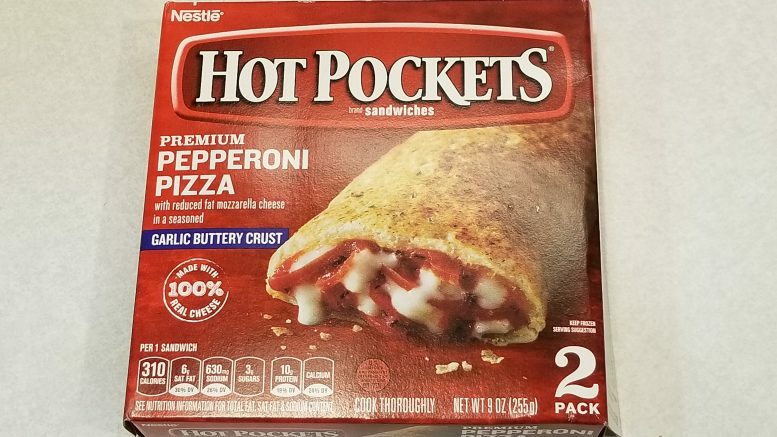 Hot Pockets have been around and slightly leaking out their innards in the microwave for a while now, with all the tasty ingredients you know and love, like methylcellulose. Yea, so, that’s a laxative. Just look at that pocket of heat. Bets on whether it looks that good coming out of the microwave? There’s definitely some nutrition in these Hot Pockets. Although some people have compared the nutritional value of Hot Pockets to kerosene, there were some unexpected guests at this party. Looks like some non-saturated fat snuck in with the real mozzarella. Then, we had a surprise appearance from 10 grams of protein, she’s always great to chat with. Another interesting assortment of ingredients here. Wait, what’s the “*ingredients not in real mozzarella cheese” asterisk about? I was also running low on my sodium stearoyl lactylate, glad some came with the Hot Pockets. The sleeve did help in the crispiness levels. Going with the microwave approach, I was ready to eat my Hot Pocket in about 2 minutes (allowing 2 minutes for it to cool). To be honest, it was a little underwhelming. This was mainly due to what felt like an excess of bread and less filling. The garlic buttery crust itself was good, but the pocket to filling ratio was a little bit unbalanced. Speaking of that, the filling was probably made of a lot of those chemically ingredients and frankly wasn’t that great either. I hate to be so critical of a staple in so many millennial freezers throughout the country, but honesty is the best policy. Maybe these weren’t as good because of the inclusion of the semi-natural mozzarella, that was a new addition as of the last few years. I was also hoping that the laxative ingredient they have in this would work since I’ve been putting away so many Jimmy Dean sandwiches lately, it didn’t.